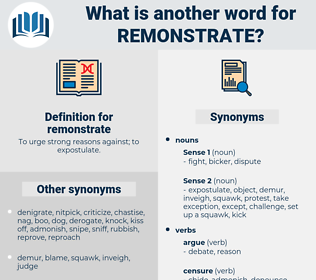 What is another word for remonstrate? 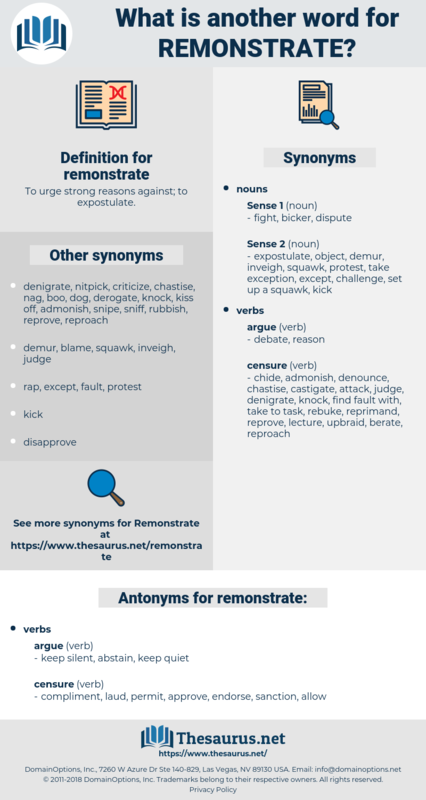 To urge strong reasons against; to expostulate. keep silent, abstain, keep quiet. compliment, laud, permit, approve, endorse, sanction, allow. commend, be content, be happy, praise, recommend, applaud. uphold, comply, obey, defend, support, eulogize, cheer, accede, conform, follow, advocate, assent, maintain, mind, observe, sustain, adhere, acquiesce, champion. As no one appeared he determined to seek an interview with his father or mother or some other member of the family, and remonstrate against the outrageous treatment he was receiving. No," she added resolutely, as her mother began to remonstrate; " what I resolve upon I intend to do hereafter, even to the least thing.